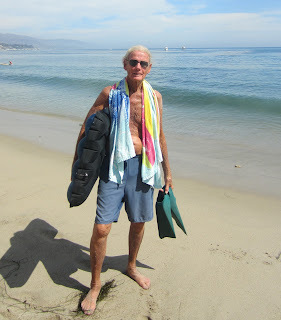 Cal Porter -- September 21, 2012 -- 88 years old today, sporting his Churchills and his Classic Fourth Gear Flyer. He's been out on it every day since Friday. Scored some fun waves while on vacation with Lisa. Only took the mats with us. Lisa wants to try the mat because it looks like fun! I'm back in San Diego now but to answer your question I was out on our Ericson 38. My wife Nicole came up to Santa Barbara and joined me for a week. Here's a pic you might like of Nicole 4th Gear Flyin' a few weeks ago. 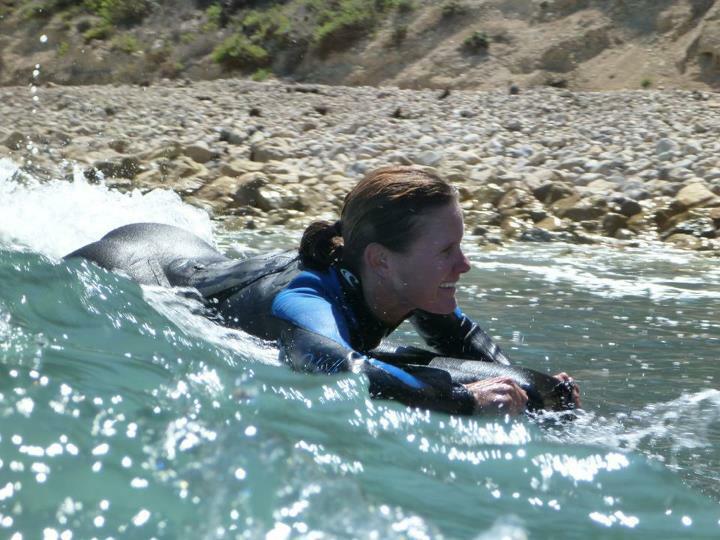 She's a school teacher in the winter and a San Diego ocean lifeguard in the summer. Did I tell ever you the story of the jet-ski assisted step-offs my friend and I tried with the mats on the biggest day of last winter? Last month I only had two surf sessions but during both of them I was using a surfmat. In the beginning of August I had my best session in Sweden yet. I used my Standard and had some of the best rides I have ever had. The spot is only rarely good, but that evening everything came together. Just 3 other surfers in the water, wind and waves from the right direction and magical light. 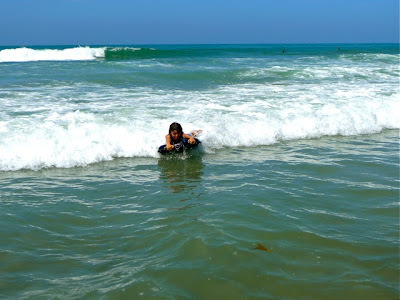 Last weekend I was able to surf there again. This time it was quite crowded and the waves were closing out much more. Although the rides were shorter I had some fun and my wife was so kind to film while I was in the water. Missed the swell from "Leslie" at Rockaway, coz "they" sent me to Saudi. Missed the regular swell in Bali right now, coz "they" didn´t send me to Singapore out of my stand-by coz I had to stay close to my dad who´s been in intensive care for the last 10 days. Saw some wind-swell in Malta instead - way too much scraggly old volcanic rock-shore for the mat or my body, though. Then - on the way back - we witnessed this big old wave formation with shifting peaks. Guess, "they" sent me mind-surfing. period: at least 135 million years and counting. People have been known to slide its frozen surface every local winter for over 100 years. You have similar ragged patterns nearby, as I´ve seen. The best season will start soon! Some images of the new Standard in action. Here's the trial run of my new POV rig! (that's the UDT I'm riding... if you're curious). 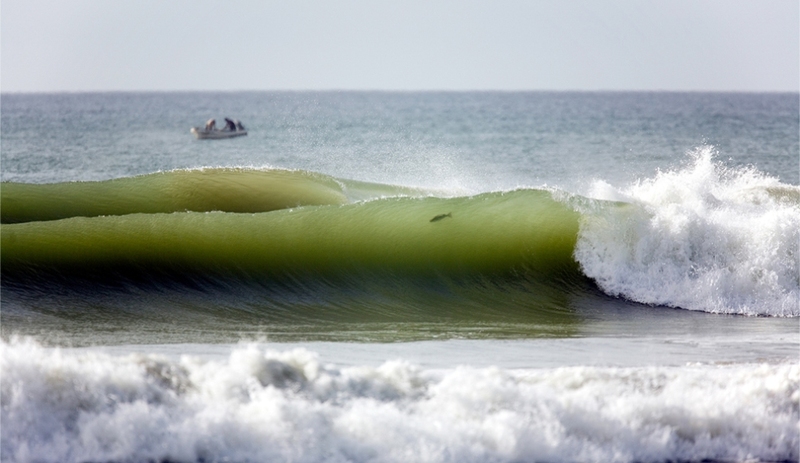 The combo of south swells over the Labor Day weekend was kind of a bust..size and consistency-wise. The clip still provides some sensation of speed, even though the "footage" was recorded at 48fps to slow it down a bit. Just a reminder! 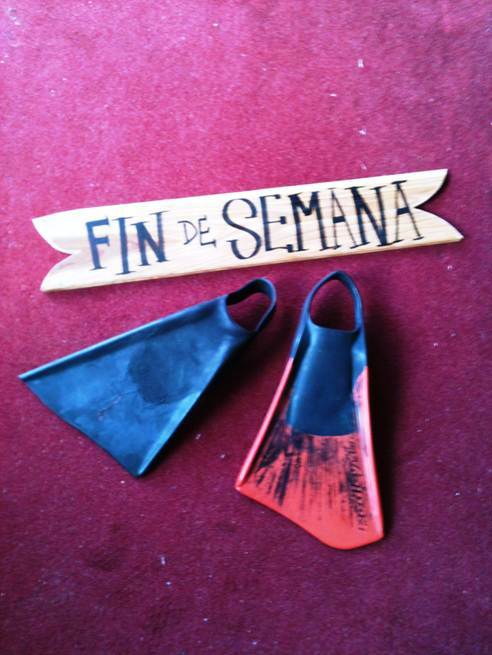 Please feel welcome at "Fin de Semana," A show of paintings by Dave Gardner and photos by Jonathan Steinberg. It promises to be great fun. We will run the show Garage Sale Style. Come early and stay late! Hope everything is well. Any new mat news?? Finally some decent swell in the Netherlands. A clean 4 to 5 ft wave. I have no legs anymore! I'm using the roundtail tracker alot. Like that mat very much. Tonight Coldplay is playing in The Hague (67.000 people!) so tonight Esther and i are of to a great concert. Have a great day and speak to you soon! 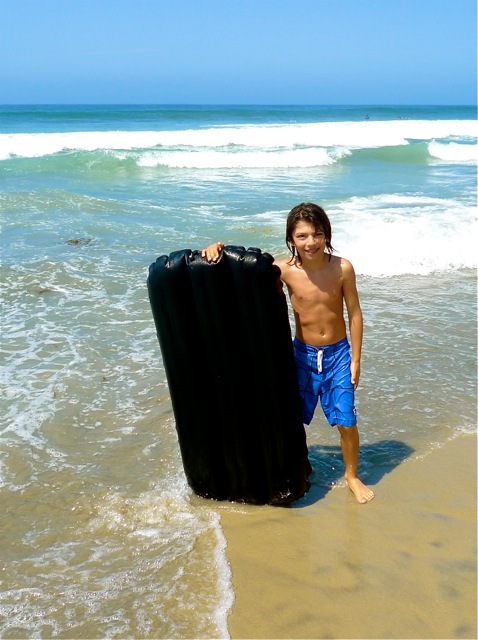 This Is The Way I Want To Surf !!! We've come into spring with wind and no swell which has been perfect for the UDT RT, I really enjoy the challenge of riding micro waves... its just as much fun as when the surfs good ! We will still get some good surf at this time of year but it will be a little less consistent. PS Michelle loves her custom standard. After almost matting my legs off in Camburi, I was planned for (and more importantly PLANNING!!!) a dawn mat-meet at Rockaway Beach, NY... ex Jersey City via Pathtrain and Subway (what a trip in itself just to "watch" "people" at that time of day). Check out the surf forecast why. LESider had/has to shoot pics at NY Fashion Week (one more reason to go to NYC just then!!!! ), but maybe stoked - "Jason" could be set up with me...Then THEY (my airline) changed my schedule to go to ---- Jeddah, Saudi Arabia!!!!! I´ve had my fill for a few weeks, I suppose. Whatever. At home (Bonn, Germany) here on the river, dodging barges I´ve scouted some fishing niches. 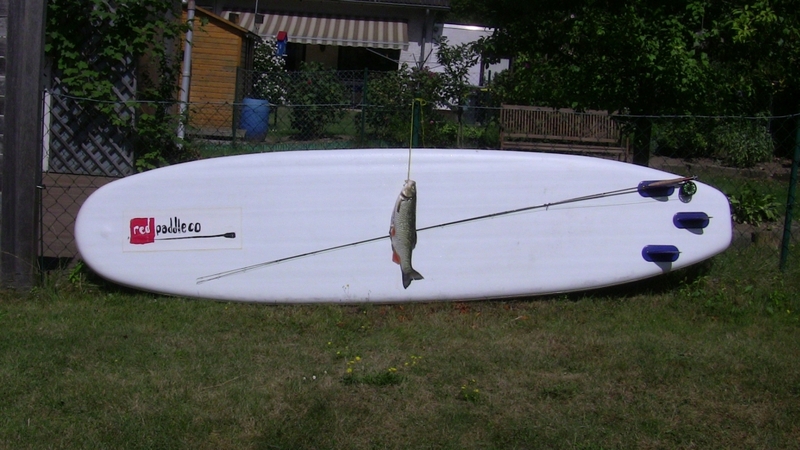 See/bear the (5lb after gutting, +2lb of filet after that) Chub caught after paddling the inflatable (!!) SUP to the spot, getting in the water up to my hips in (life´s-better-in-) boardshorts and flicking the 5-weight fly-rod and a muddler. 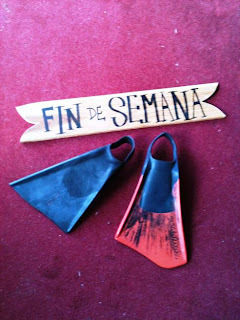 Latest, next year, I´ll be training to stay (in the ) "river current" on the mat with fins. Have had too many visons of that. Having mat-sessions terminated by calf-cramps stinks.